With 55 fraternities, 36 sororities and over a fourth of the student population involved in Greek life it’s hard not to know someone in a fraternity or sorority. Recently, we had the opportunity to get to know someone new involved in a fraternity on campus. Nathan stopped by the lab to print something for his fraternity, Chi Epsilon. Chi Epsilon is the National Honors Society for Civil Engineering. Students are chosen to join this fraternity based on 4 traits that Chi Epsilon considers important in order to be a successful engineer. Those four traits are Scholarship, Character, Practicality, and Sociability. Once students are chosen based on these four traits they enter the initiation phase of joining the fraternity. Initiation is the process of learning the mission, values, other members and history of the fraternity. At the end of the initiation process new members become official pledges of the fraternity. Nathan decided to come to the MakerLab to print something that would make the end of initiation a memorable time. 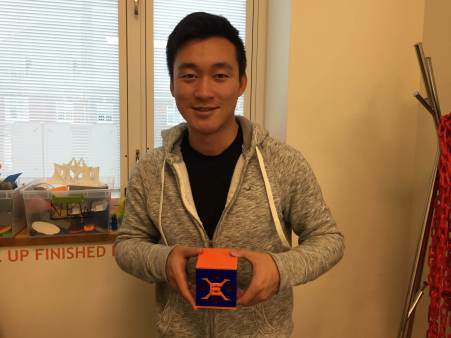 He 3D designed and printed a box that could be opened with a key. The opening of the box signifies the end of initiation and the first steps in being a full member of the fraternity. You’ll have to join Chi Epsilon to see this box in live action! Or you can settle on viewing some pictures below.